Introducing the latest trends set to shape the office environment. Office design has never played a more integral role in the success of a business as it does today. New technologies and new trends emerge, pushing workplace design into new and innovative territories. In the report, Ambius elite designers have identified Macro and Micro trends that are driving the future of business designs. Learn how you can incorporate the new trends into your space. 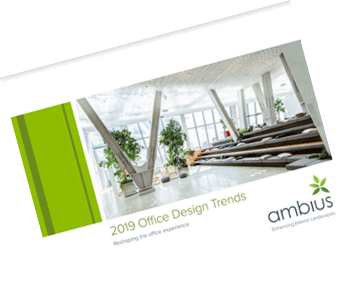 Download the Ambius 2019 Trends today. Inside the Office Design Trends of 2019, you will find in-depth analysis of the design trends that are transforming the Office space and more. The latest design trends for 2019 and beyond. Tips to help you identify the right design strategy for your business. Desgin analysis from Ambius award-winning design experts. Breakdown of Macro and Micro trends to integrate into your workplace.